Aren't these bunnies the cutest???? My little bunnies were colored with Copic Markers. After coloring the bunnies, I masked them and added the background by sponging Distress inks for the sky and grass. And I had to add some carrots! Or you can start at the beginning! How stinkin' cute!!!! Love these bunnies!! Love your trio of bunnies! Beautiful coloring and I love the carrots! The perfect finishing touch! All three bunnies, how cute and love the little carrots! Oh my loving the background and the bunnies are precious!! !carrots are cute too!!! Sweet card! 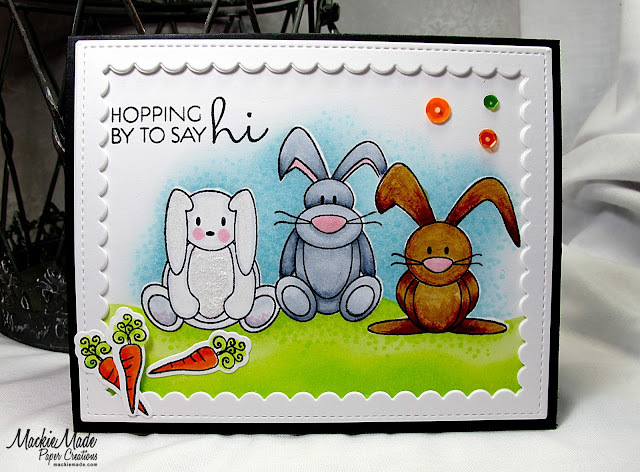 Love the colors and details, like those cute carrots! Oh, this is ADORABLE, Mackie! Love the sweet little water colored scene you created! What a cute bunch! Love the way you colored the background! I love these fun colors, Mackie! Cheerful and fresh! So adorable! I love that you used all 3 bunnies. Really cute! This has to be the brightest card today. Just lovely. Love how you used all three bunnies :) Darling card. Love how you gave individual character to each of the bunnies and placed the carrots in the corner as a perfect accent! OMGosh these are all so cute together. This is a gorgeous card - love it! What a sweet bunny family! Cute! Those bunnies are so sweet. Those are the sweetest and cutest bunnies around! Awesome card! it's a lovely and super cute card! Adorable trio! Coloring each one a different color was perfect! Those little carrots make me smile for some reason! Creative--putting the carrots on the corner of the frame. Great look. All three bunnies look marvelous in different colors. Super cute card. I love all the cute bunnies and how you colored them differently. So cute!! I love how you used all three sweet bunnies! Sweet! I love the bunny trio! Great card showcasing each of the bunnies in this sweet set! I love your background and framed front layer too! So fun! Super CUTE Easter cards...love those bunnies!!! Gorgeous card! Your colouring and sponging are stunning. What a beautiful scalloped border. Such a happy card! Love your bright colors and your coloring. Your background is marvelous Mackie and those bunnies so cute! This is such a sweet card! So cute! LOVE the frame and those carrots! Wow! Three cute little bunnies! Loving your card and how sweet it is. It could be used for many occasions, which is why I'm really enjoying the variety in this release. Wow! This is awesome. I love the little scene you created with the bunnies and carrots -- the sponged blue sky and green grass is perfect. My favorite bunny is the one with the floppy ears. Such a sweet scene you've created, Mackie! Love your coloring! Sooo super cute! Love those bunnies in a little trio like that! Love the frame around those cute bunnies. these bunnies are so cute! These bunnies are just too cute. I think the carrots are my favorite stamp of the set. Those 3 bunnies are adorable. Great share! Awesome bunnies!! Love the details you added to each of them, especially the glitter to the white bunny. Thanks for sharing your AWWW-dorable card. Those bunnies are sooo cute. What a cute framed scene you created with these adorable critters.